Dear Serious Mood, you and this devil weather need to get the heck away from me. Dear She's the Man, you definitely helped lighten that mood and always make me laugh hysterically. "Thanks bro". Dear Beach Vacation, you were a blast, but I am seriously exhausted...as in full on narcoleptic during the drive home. (Yes, Noel was driving.) Dear Sister, I miss you while you're at the School of the Arts. Dear Sister in Law, yay (!!!) for getting engaged. So proud and excited for you. Dear $18 JCrew Skirt, I am giddy from finding you. Dear Charlie and Walker, my loves. I thank Heavenly Father everyday for you two. I love She's the Man...so funny..I actually watched that a few weeks ago during my summer break. Cute family pic! Hey there, I'm visiting from Friday's Letters! My hubby is considering a job in Charlotte, I've heard great things about NC! Great blog! love the patriotic family photo! have a great weekend! "Sorry, Mom. I have a strict no-ruffles policy." hahaha! LOVE She's the Man! Your family is too cute. I wish we were still in Winston, we would hang out all the time. Hope yall get a break from the heat this weekend! our beach trip was exhausting too. but so much fun! found you through the link up! Dear Ashley, the bad weather will stop. I know these things. Dear Ashley, do you feel bad for not bringing me on the beach vacation, still? Dear Ashley, I love She's The Man.. "thanks bro.." I laughed at the thought. Dear Ashley, I hope you have a great day. Dear Ashley, cute post and darling pictures of the family!!! Hang in there doll the weather will break and take some more movie time to rest up! Dear Ashley, I love you and your little family! 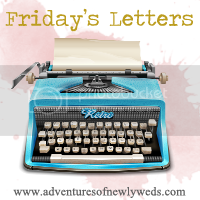 fun Friday letters!! and a fun idea!! oh my gosh. how cute is your family?! She's the man is one of my all time favorite movies! It would definitely need to be on a deserted island with me. I totally meant to say J Crew SKIRT, not shorts. Brain fart! Vacations are like that so fun but often leave you more tired.